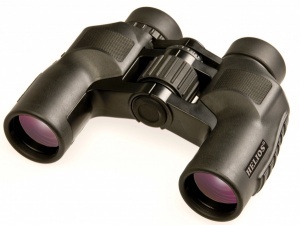 The Helios Aquila MS 8.5x32 are high quality mid-sized waterproof, nitrogen-filled centre-focus porro prism binoculars, featuring a durable black rubber covering and are designed for fog-free viewing in wet weather conditions. Extremely comfortable to hold due to their convenient, ergonomic design and light weight. They feature multi-coated optics and BaK-4 Prisms, providing outstanding optical performance for their relatively compact size. Twist-up rubber eye cups for spectacle wearers.